Until I lived near the sea in Dorset I'd never heard of Alexanders. For a long time I didn't know what they were. I still have a problem with their name; a singular that sounds like a plural. Sheep are the same. How many are there? Is it a flock or a one? When it comes to Alexanders it's definitely a flock. No. That's rash. It's flock after flock after flock along the hedgerow - and in summer their flowers smell sweet. At least, to me they do. Some people don't like the smell. It's dog poo baking in the sun beside them that I dislike. I wish I could remember not to take a deep breath when I come over the hill and see the sea! In summer they come up to my shoulders. Some will grow taller than my head. At the moment they are about one foot high. We don't have many frosts here. We hardly ever get snow. 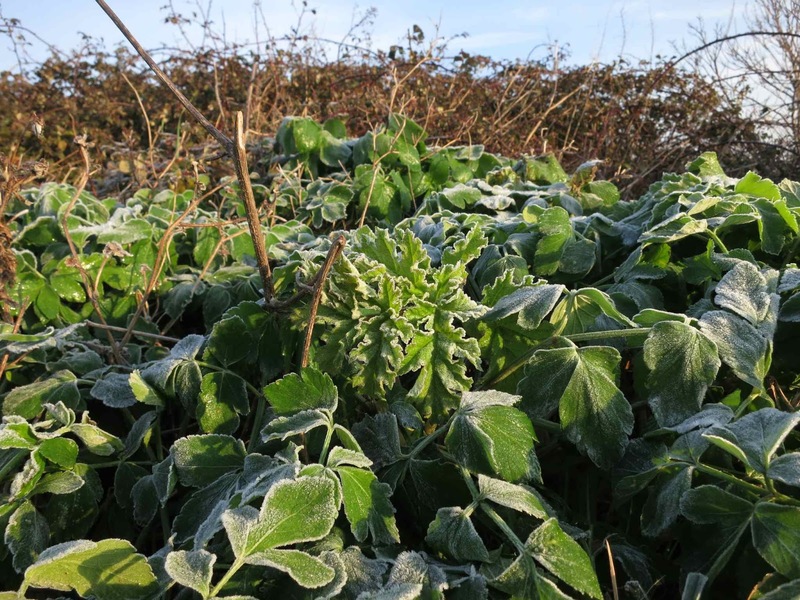 But when there are frosts (two or three a winter - and one of them was when I went out on the morning of 23rd January) the poor old Alexanders get zapped. They flop. It doesn't seem to matter. I don't know how many, if any, die. Or how many spring up to replace them. 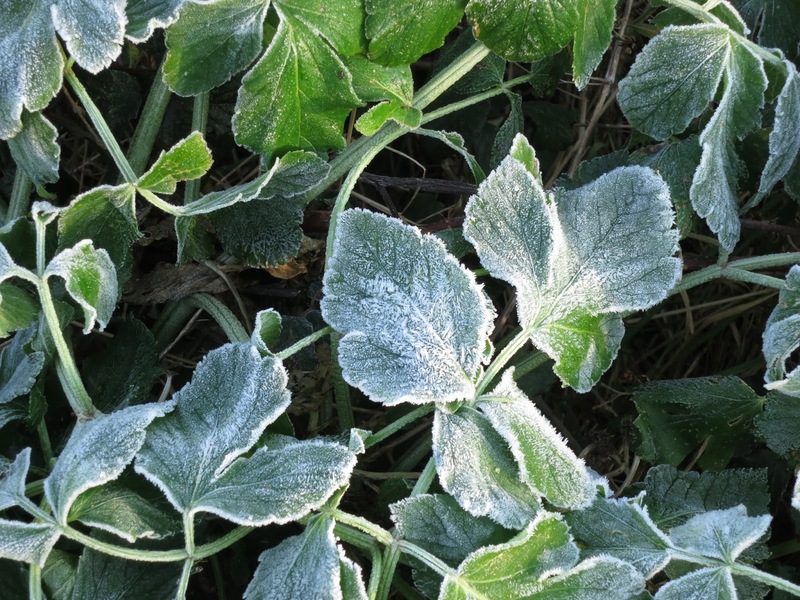 But on that Friday morning they looked very frost-pretty. Flopped and un-flopped. 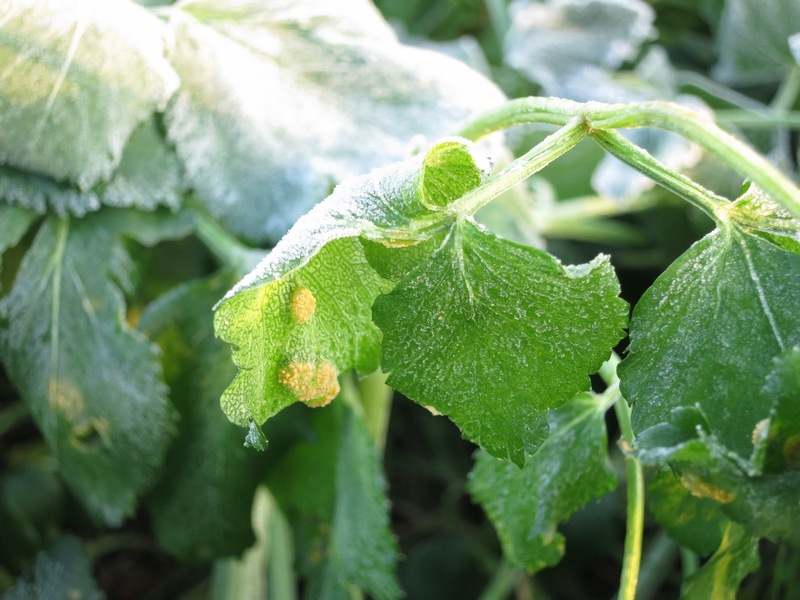 The ones with a fungal infection called 'Alexanders Rust' (the little yellow blobs) just as much as those without. Then the sun came up further. The mist cleared. The frost began to melt. Soon it was gone - leaving the leaves wet and shiny. Would you like to see the bench - the bench where I sit and think? Nearly always there's a view - but that morning there was a mist over the sea; and the sun coming up got muddled in with it and it was . . . dramatic? 'It Depends on the Background' - a very short Loose and Leafy post from May 2013 with a photograph of Alexanders in flower. 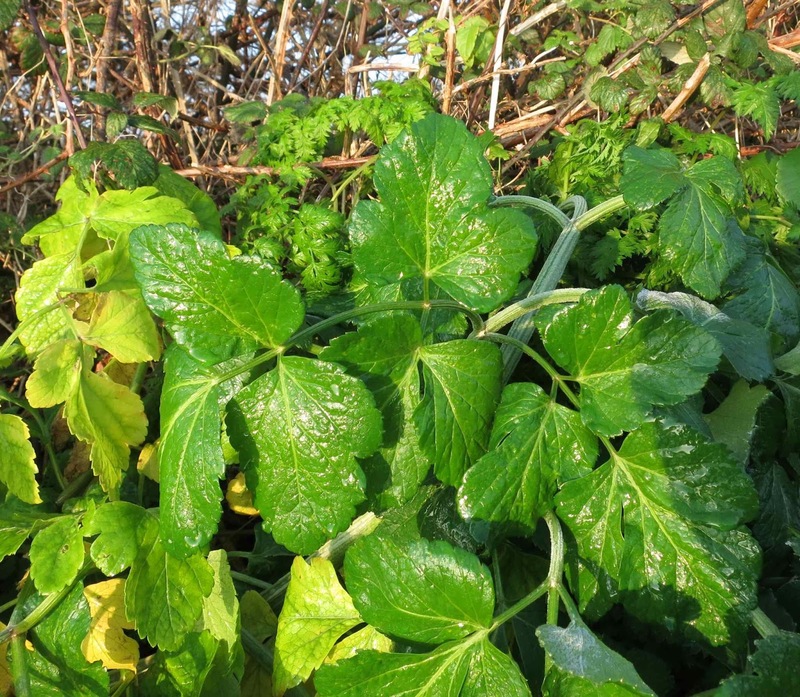 Recipe for Alexanders Chutney - Wild Food Guide to the Edible Plants of Britain. (I don't like chutney so I've not tried the recipe. You might be interested in the site even if you don't either. I don't know Alexanders-I had to look them up for bloom and other photos. They're quite pretty--are they always in conjunction with dog poo? I first saw this plant when I went to the sea side last year, and how wonderful it would be to sit on that bench, I can smell the sea.. Here in Devon the Alexanders near the sea have been looking very healthy: green and shiny and prolific. They seem very far on for the time of year but I suppose it depends what the weather brings. Hello Jack at Gardens at Waters East - This bench is an odd one in that it feels very 'away from it all' - it being slightly off the path and facing out to sea. At the same time it's a popular place to sit. So sometimes one has to go away and come back again while other people have their go at sitting there. Hello Tina at mygardener says. Because Alexanders are such a noticeable plant round here I tend to think I mention them on this blog more than I do. I'll have to write a summer post to show what they are like when they are full grown. The dog poo . . I don't suppose they are associated with dog poo everywhere but here they grow by a path that's popular with dog walkers. This isn't very noticeable in the winter (though you have to take care where you step sometimes!) but the south coast of England is very hot in summer compared with the rest of the UK. It's one of the reasons it's such a popular holiday destination in some areas along here. But as much as the sun releases the scent of Alexanders it releases other less attractive odours too . . . Thanks for the links. As well as the chutney, there is a recipe for "Buttered stems of autumn Alexanders" which sounds worth a try. Could be like Asparagus! There used to be a beautiful length of alexanders along Cable Street at the side on the railway from Essex into Fenchurch Street. I like to think that they came from somewhere along the line. They were tramelled and covered in tarmac one day. Very sad face. So good to have a bench for sitting and thinking! Every one should have some where to sit and think, I an envious of yours. I've never heard of Alexanders before. They sound pretty impressive and look lovely frosted and shiny. What a lovely bench, that's the perfect place for me, looking out over the sea. 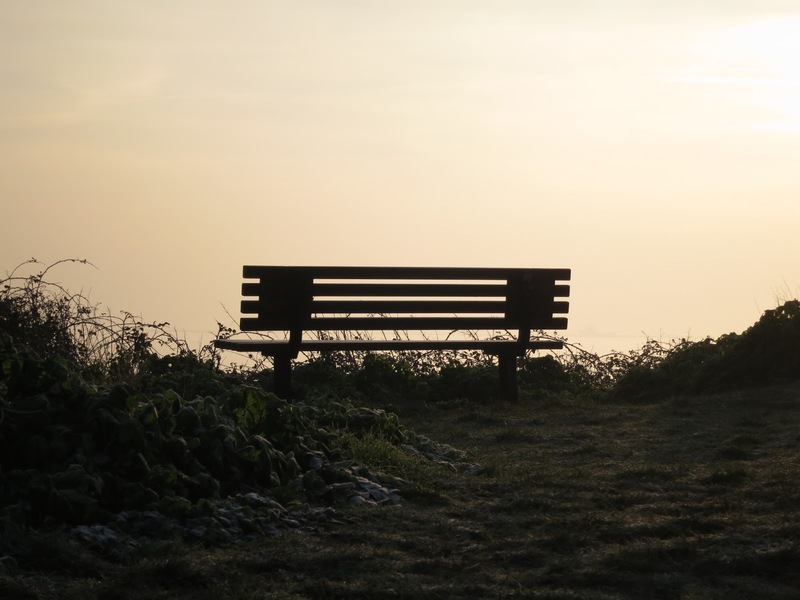 Love the bench and the frosty views.